I can think of few compliments greater than comparing somebody to Rabbi Shlomo Carlebach zts"l. And since Reb Shlomo was one of the truly great spiritual leaders of our time and is certainly one of my personal "super-heroes," I wouldn't make such a comparison frivolously. There are voices of peace in the Arab and Muslim world. They are not as loud as the voices of terror, but they exist, are working to stop the violence, and should be given voice even at difficult times. Or, especially at difficult times. Herein is a glimpse of how good things can really be between Muslims and Jews here, about a Sheikh who exudes a Shlomo Carlebach kind of love for everyone from his hub of hospitality on the Mount of Olives. But in view of the terrorist murder of Alexander Levlovitz Hy”d, I did lose heart, almost shelved this. I called the Sheikh as a courtesy. He answered the phone and immediately said, “Salaam Aleikum Rebecca, I am very busy with the terrible things happening in Jerusalem, violence is not our way.” I pushed further: “What are you doing, Sheikh, to stop the violence?” I do not know why we expect a peace-seeking Arab Muslim to go fix the rest of them, like when people expect me to go fix all the Haredim. But the question was asked. “That is exactly what I am busy with. Right now, people are on fire. Outsiders are also interfering.” And you will see more of his philosophy, which has made him famous world over, below. Business woman Maksoom Hussain, originally from Pakistan and now residing in the UK, added her voice to the condemnation: “Of course I condemn all acts of terror, no matter who is responsible. Any life lost is one too many. Another family mourning their dead adds to the heartaches and pain, and this is opposite to what we all hope and pray for, which is a world where all can live in peace and nobody has to worry about their family returning home. May Allah rest brother Alexander Levlovitz’ soul and soothe his family and friends with his love and mercy. When violence happens, we freeze and try to protect ourselves, but our Jewish family needs to hear that there are many Muslims who pray for a peaceful and pain free world for all children of Ibrahim (AS). American Muslim Fionna Connors posted a condemnation on her facebook page: “Alexander Levlovitz died recently in a rock attack in Jerusalem. He was pelted with stones, lost control of his car and crashed into a ditch. I wish to offer public condolences to his family and to publicly condemn this attack." And you remember the thundering rebukes I have already quoted by Egyptian Muslim Omer Salem against the violence, both past and present, that emanates from his people and that he is tirelessly working to bring a halt to. Go to my previous articles to look them up again. Please pause for a moment and witness real grassroots conciliatory efforts as I introduce you to the Shlomo Carlebach of the Arab world, Sheikh Ibrahim Ahmad Abu El-Hawa, of the Mount of Olives, Jerusalem. It’s all about love here, and in Sheikh Ibrahim’s mind, love means giving freely. His home on the Mount of Olives is a hub of hospitality, boasting twelve rooms crammed with beds and a seemingly endless supply of food for all who visit. Rabbanit Hadassah Froman, widow of the late Rav Menachem Froman of Tekoa, in Gush Etzion, states, “Sheikh Ibrahim was Menachem’s partner for many years, they did much together in the way of peace. Ibrahim was with us in the hospital when Menachem had surgery. I was reciting tehilim, Ibrahim was reading the Qur’an. Whenever we needed him, he was there; he was always at our house for the shiva. And he has a big family. He is a man of miracles, anyone asks him to go, and he just goes. Like Avraham Avinu, Hashem told him GO! And he just went! Ibrahim just goes, whenever anyone needs him. “When Eyal Yifrach, Gilad Sha’ar, and Naftali Frankel were kidnapped last summer, I organized a prayer rally, and Sheikh Ibrahim attended, demanding their recovery. If there was a “price tag” arson attack against a mosque, Menachem and Ibrahim would arrive together to comfort the community. Menachem would bring a Qur’an and say “Allah HuAkbar!” in front of the Muslims, and this really calmed the community, who of course would be very upset. Rav Yaakov Nagen is continuing.Menachem’s legacy.” Rav Nagen of the Otniel Yeshiva, Hevron, describes Sheikh Ibrahim in similar terms. “He is always there when you need him. I tried to contact him to invite him to a meeting and was unsuccessful. The participants gathered at a restaurant in west Jerusalem and who do I see outside, Sheikh Ibrahim! I called him in and he made time for us, as he always does.” And it is Rav Nagen and the Sheikh who are in a now-famous photograph, which unbeknownst to them, hopped around the internet world wide as a symbol of Jewish Muslim rapprochement. I had the privilege of interviewing the Sheikh, after I attended a meeting of Muslims and Jews to discuss the Rosh Hashana/Yom Kippur cycle, which this year parallels Eid AlAdha. When it came his time to elaborate, he jettisoned the academic and theological and spoke of how he employs love: “The story here is not about how these holidays coincide every thirty three years,” brushing off the academic, “the story is about how we are all one, all from Adam and Eve. We are all from one father, Avraham. We have two mothers, Hagar and Sarah, but G-d brought us together here in this land. We are suffering because we are apart, divided. G-d never put a sign on a baby’s face like a Star of David or a cross or a crescent moon. We are all born with the same face to say that we are all one.” “The ayah (verse) says, ‘Al Janna (heaven) is under the foot of the mother.’ The ayah does not say who the mother is, just that we are siblings. There is no attachment like that between mother and baby. A mother is something holy,” then he looked intently at me, “you are a mother, you are holy!” I felt ten feet tall. He stood to pour drinks for those present, and thinking ‘mipnei seiva takum’ – in front of the elderly you shall stand, the Sheikh is in his seventies – I quickly rose and said, “Sheikh, let me.” He would not hear of it. This was an awkward moment, and one of many you will experience if you involve yourself in understanding the other. But we will not get anywhere if we comfortable all the time. This was my chance to test all this free love versus a concern of mine for sure – preserving the Jewish nation. Can all this love lead to being influenced or to assimilation? He brushed that off quickly – “very unlikely. The natural roots of a child are in the parents. They are not likely to go astray if the child has a good relationship at home. Like I said,” and again he looked at me, this time to convince me totally, “you are a mother! You are holy!” It was a confidence-building rebuke. He sat down, I followed suit, but I pushed a little more: “There are divisions within the Jewish people. How do we deal with that?” He answered: “The separation wall between the nations is not the wall here or the Berlin wall. The separation wall is when we do not talk to each other and when we separate from each other. You have a duty to find out how your neighbors are doing, to bring them something, even something small, to eat.” Forget the debates that fuel divisive dialectic. Eat! “I learned from my parents to give, to love everyone whether Jew, Christian, everyone. In 1948 no one had much. My father would tell me, “take the sugar and coffee, and bring it to the children outside that need something sweet.” Shlomo Carlebach’s father found his way to Ibrahim’s father and discussed how Jews and Arabs can get along together. Ibrahim’s father said simply, “’your people come to this land and volunteer. Let them bring school books for the Arab children.’ And they did. Then the Arab kids brought vegetables from their garden to the Jewish settlement. Shlomo Carelbach said that my father is not mother Theresa, he was father Theresa! And that we need more people like him in this land.” “I have no passport, but I have flown around the world – I spoke in India in front of over a million people, dressed like this, (and indicated his red and white kafiyyah) I have been to over twenty states in America, and all I did to get this was to host people and give to them. The actor Richard Gere visited me here, and I visited Tony Blair and the second to the Pope.” I left aside that strange detail of how anyone travels with no passport, though I like details. Meeting ended, I accompanied him to East Jerusalem so I could savor more, stopped at red light in Rehavia. Ibrahim nonchalantly looked out the window, warmly greeted a teenage boy sporting a black hat and litvishe style black suit. Their happy small talk ended as we pulled away, beckoned by the green light. The bachur seemed totally at ease. “Sheikh, how do you know a haredi boy in Rechavia?” “I just met him now, this is what I do, talk to everyone.” At this time of year we commemorate the binding of Isaac, Akeidat Yitzchak, remembering Avraham’s test as well as his mark of hospitality, a trait which Sheikh Ibrahim Ahmad Abu El-Hawa emulates. I entitled this article, “The Shlomo Carlebach of the Arab World.” But I do not know if Sheikh Ibrahim sings. 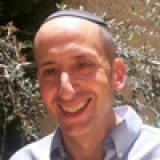 A better title would have been, “A Living Link to Avraham Avinu.” Meet him. I need not supply the address, just wander up the Mount of Olives, either you will find him or he will find you.